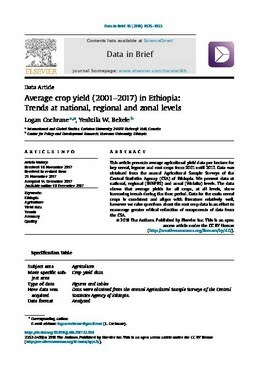 This article presents average agricultural yield data per hectare for key cereal, legume and root crops from 2001 until 2017. Data was obtained from the annual Agricultural Sample Surveys of the Central Statistics Agency (CSA) of Ethiopia. We present data at national, regional (SNNPRS) and zonal (Wolaita) levels. The data shows that average yields for all crops, at all levels, show increasing trends during the time period. Data for the main cereal crops is consistent and aligns with literature relatively well, however we raise questions about the root crop data in an effort to encourage greater critical reflection of components of data from the CSA.